Hi! I am Annie the gluten free food blogger behind Maebells and I have a super easy, cheesy recipe for you! If there is one dish that will always, without a doubt, be met with approval in my house it is breakfast. We aren’t picky. Any type of breakfast food, anytime of day, is sure to be met with cheers! While we we gladly eat our quiches, eggs, hash browns, and biscuits any time of day, there is just something special about breakfast for dinner. I remember as a kid I always felt a little mischievous when we would have breakfast for dinner. Almost as if we were getting away with something special! 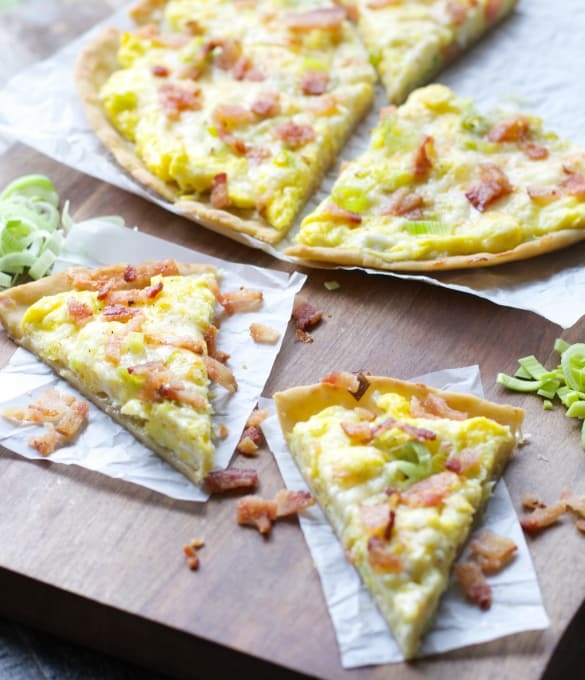 This hearty Breakfast Pizza with Bacon and Leeks is a simple, no fuss dinner (or breakfast) that is sure to be a winner. 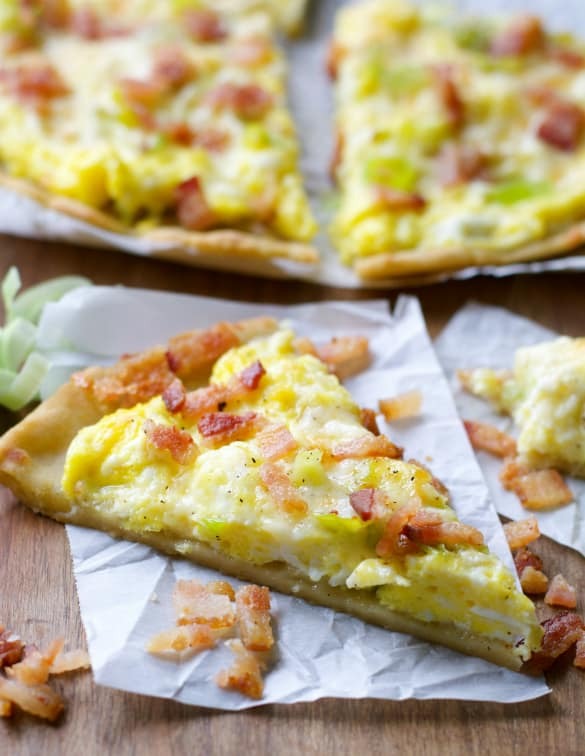 Thin, crispy gluten free pizza crust is topped with sauteed leeks, scrambled eggs, sharp white cheddar cheese, and crispy bacon for an impressive dinner that is ready in a flash. Grease a 12 inch cast iron skillet or pizza stone and press the pizza dough into the pan. You want to spread this thin so it is nice and crispy. Pre-bake crust for 5 minutes, then set aside. Heat a skillet to medium heat and cook the bacon until crisp. Remove from the skillet and set on paper towels to drain, then chop. Drain most of the bacon grease from the skillet, reserving about a teaspoon. Add the leeks to the skillet and cook for one minute, stirring occasionally. Remove leeks from skillet and set aside. In a small bowl beat the eggs and milk together, pour into warm skillet and lightly scramble the eggs. You do not want to cook your eggs completely, because they will finish cooking in the oven. Remove them when the scrambled egg begins to form, but while they are still undercooked. To assemble the pizza, add half the leeks, top with the scrambled eggs, the rest of the leeks, the shredded cheese and salt and pepper to taste. Bake pizza for 7-8 minutes, remove from oven and top with bacon.